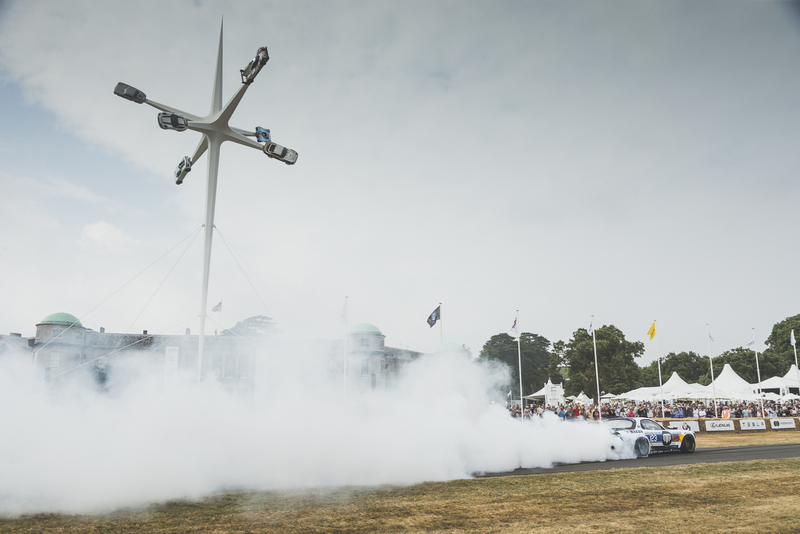 It’s no secret that the Duke of Richmond and his team of Goodwood organisers took huge trouble this year to inject new and spectacular elements into the Festival of Speed in an effort to mark its 25th anniversary. Not everything was revolutionary, mind. The trick, they’ll tell you, is to keep the new stuff coming while continuing with much-loved elements that keep bringing people back. History helped a lot. Porsche took the limelight — and informed every attendee to its 70th anniversary — as the chosen marque for sculptor Gerry Judah’s massive central display on the Goodwood House lawn (below). It was the third time Porsche has taken centre stage at Goodwood, but this was the biggest array of the Stuttgart firm’s road and racing cars ever. They even brought the first ever Porsche ever, a Beetle-based creation that, unlike the production 356s that came after, was mid-engined rather than rear-engined. Land Rover celebrated a 70th anniversary, too. It assembled a parade of 70 cars on the festival’s first day and paraded them slowly and in date order up the famous hill climb. There were short Landies and long ones, station wagons and ragtops, and fire trucks and farm diggers in a half-mile parade led by a recreation of the original Jeep-based 'centre steer' prototype, followed closely by the famous HUE166, very close indeed to the first-ever S1 production models. Goodwood has become famous for its supercar line-up and this year had a bumper crop; no other world car event can display so many and put them all into such dramatic action. As well as the spectacular but expected displays of Ferraris, Astons (the Gaydon company showed a new Rapide AMR saloon and limited-run Vantage V600) and McLarens (we drove the new 600LT up the hill), there were less familiar, more spectacular shapes such as the Nio EP9 and the 769bhp Apollo IE (for Intensa Emozione) whose claimed 0-60mph time of 2.7sec is nowadays about par for the course for full-house supercars. There were Indycars, NASCAR sedans, GT cars, racers from the turn of the past century and, of course, Formula 1 cars. 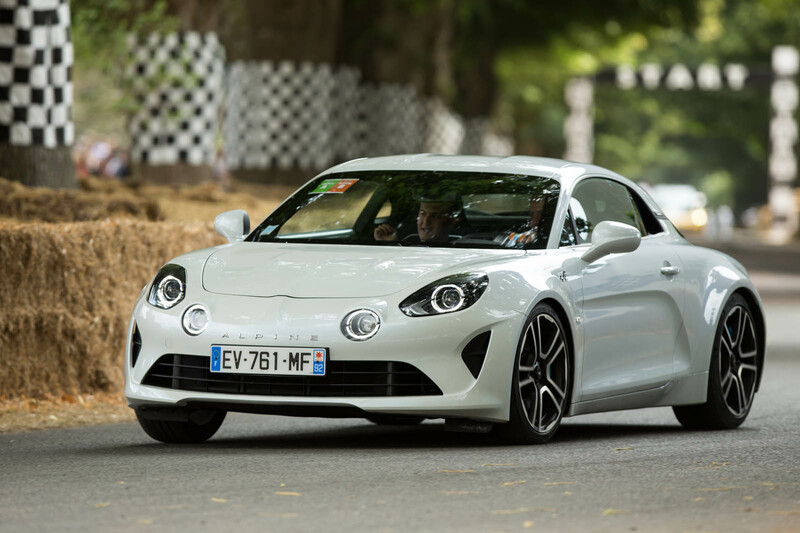 One trend was obvious: these emerging supercars get ever more convincing even as prototypes with odd names, perhaps reflecting the rapid global growth in the number of high net worth individuals who drive the exotic car industry so hard nowadays. Talking major money, auctioneer Bonhams had hoped to create a world-record price beyond £12 million at its Goodwood sale with the extraordinarily famous, ex-Jim Clark Aston DB4 Zagato, registered 2VEV. It achieved 'only' £10.1m (including buyer’s premium) in the end — still a record for a British car at an auction in Europe. To put icing on the auction cake, a one-owner 1958 BMW 507, bought by the boss of MV Augusta as a present for the late John Surtees after he won his first 500cc world championship, and owned by Surtees until his death last year, raised £3.4m — well ahead of the £2m-£2.5m estimated. Ford unveiled, for the first time in the UK, the recently rediscovered original Mustang from the legendary Steve McQueen film Bullitt, displaying it on the hill and in the supercar paddock with an edition of its just-landed 2019 Stang, also available in a Bullitt edition priced in the £50k bracket. The '68 McQueen car even re-enacted the film’s famous chase scene with a black Dodge Charger on the hill. Marking the festival organisers’ determination in recent years to chronicle automotive progress, a Roborace autonomous (driverless) racing car drove up the hill — a world first. And a classic Mustang engineered for autonomous driving by students at Bedfordshire’s Cranfield University — and displayed to publicise the availability of advanced motorsport courses — also drove up the hill, albeit with a non-driver behind the wheel, just for safety’s sake. And then there was the rocket man, David Mayman, with his jet pack JB11, performing his first-ever European flights. VW played a blinder for new technology, too, beating all comers at this year’s timed runs in the ID R, which recently set a new Pikes Peak record for electric cars and did the same here, albeit not quite eclipsing Nick Heidfeld’s 1999 outright time, set in a McLaren F1 car. In all, Goodwood 2018 was a first-class event, staged over four days of peerless weather and featuring dozens of new elements, yet with a satisfactorily reassuring collection of old favourites. 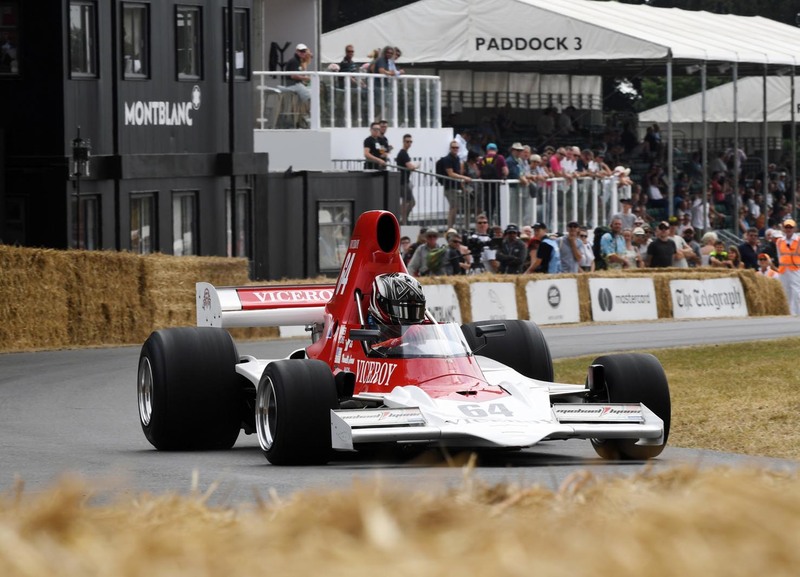 As crowds streamed home on Sunday night, the predominant opinion seemed to be hearty agreement that this king of motoring events, as important these days as the British Grand Prix, was in the finest possible fettle to begin its next quarter of a century. The last time I went to Goodwood FoS was when Nick Heidfeld set the outright record, that I believe still stands to this day, in a V10 McLaren in 1999. I'm sure when he was interviewed afterwards he said something like he was only going at about 70% because he'd been told not to break the car! I went to the first FoS and several after that. I gave up going as the crowds were getting so big and it was just a problem to get to see much. I wonder if people will flock to the event if more and more electric cars are going to be the norm. The thought of these quietly going up the hill will surely be an issue. I guess over the years I saw all the great cars and I no longer feel the need to go again. I hope it does continue as there will always be 'new' spectators, but tyre smoke and drifting is not for me ! I am trying to read the interesting values for having good work for the festival speed. The following resources included with essayontime.com website auto car care services and other values. Thank you so much for the making this article in my system download firefox browser now all user can get the benefit of ths site.